In high season, our apartments are rented by the week, Saturday to Saturday. However, if you require a shorter or longer period, please contact us. In low and middle seasons, we also accept reservations for a minimum of three days. All apartments are self-catering with a well-equipped kitchen or kitchen corner in the dining-living room. A wide variety of food supplies are available from Greve which has an excellent supermarket and many smaller food shops. 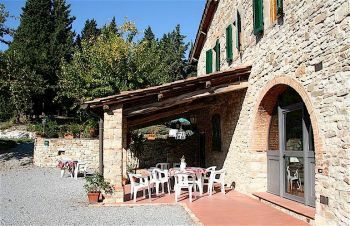 There is a restaurant in Montefioralle and many restaurants both in Greve and in the surrounding countryside. The number of people each apartment sleeps can be supplemented as indicated by a foldout double bed in the living room. This is especially convenient for families with children. Apartment No. 1, Terrazza for 2 (+2) persons (50 sq m) - on the ground floor with independent access from an external, covered terrace into a sitting/dining room with kitchen corner, one double bedroom, and one bathroom with shower. There is a double sofa bed in the living room if required. Apartment No. 2, Vite for 2 (+2) persons (50 sq m) - on the ground floor with access from an external covered terrace into a sitting/dining room with kitchen corner, one double bedroom, and one bathroom with shower. There is a double sofa bed in the living room if required. Private gazebo with table and chairs. Apartment No. 3, Geranio for 2 (+2) persons (50 sq m) - on the ground floor with access from an external covered terrace into a sitting/dining room with kitchen corner, one double bedroom, and one bathroom with shower. There is a double sofa bed in the living room if required. Private gazebo with table and chairs. Apartment No. 4, Cipresso for 4 (+2) persons (75 sq m) - on the first floor with access from external stair into a spacious sitting/dining room with kitchen corner and fire place, two double bedrooms, one bathroom with a shower and one bathroom with a bathtub. There is a double sofa bed in the living room if required. Private gazebo with table and chairs. Apartment No. 5 Camino for 4 (+2) persons (75 sq m) - on the first floor with access from external stair into a spacious sitting/dining room with kitchen corner and fire place, two double bedrooms, one bathroom with shower. There is a double sofa bed in the living room if required. Private gazebo with table and chairs. Apartments Camino and Cipresso have a common internal entry and can be booked together for 8 (+4) persons). Apartment No. 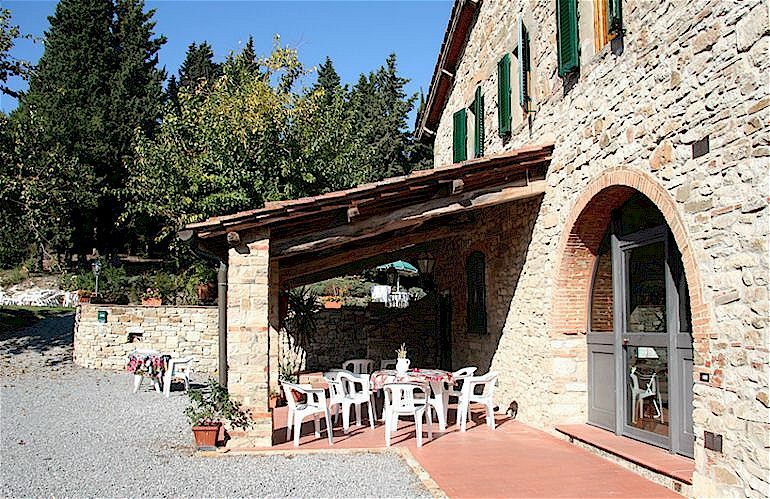 6 Gallo Nero for 4 (+2) persons (80 sq m) - on the ground floor with independent access from an external covered terrace into a spacious sitting/dining room with kitchen corner and fire place, two double bedrooms, one bathroom with bathtub. There is a double sofa bed in the living room if required. Apartments Terrazza and Gallo Nero share the large sheltered terrace on the ground floor and can be booked together for 6 (+4) persons. 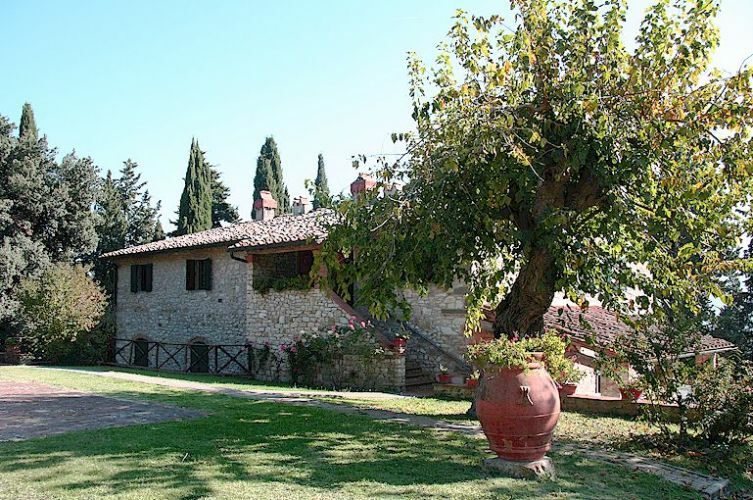 Villa Il Sole for 6 persons (120 sq m) on two floors. On the ground floor, which has its own entrance, there is a living/dining room with kitchen corner (equipped with fridge, freezer, gas rings, oven), and a double bedroom and a shower/wc. From the living room an internal staircase leads to the second double bedroom with private shower/wc. A twin bedroom is accessed via a private entrance outside and has its own shower/wc. Villa Il Sole is a restored stone hay-loft, located near the swimming pool and with a private area overlooking the cypress forest. With gazebo with table and chairs in front of the entrance door. Included in the prices: water, electricity, gas used for cooking, sales and tourist taxes, parking place for one car, and use of the pool, washing machine, barbeque, garden and park. 1. Please make your reservation using the reservation request form. We will reply as soon as possible regarding availability and price. 2. Your reservation will be confirmed definitively as soon as we have received your deposit of 30% of the total price. The deposit should be paid at least one month before your start date. In the case of a cancellation made 30 days or less from arrival date, the 30% deposit is forfeited. For a reservation made less than one month before your start date, please pay the entire amount to confirm your reservation. 3. For stays of one week in high season, the apartments are rented by the week beginning on Saturday (arrival time between 3 pm and 6.30 pm) and ending on Saturday (departure between 8 am and 10 am). For other periods, the apartments maybe accessed on the day of arrival between 3 pm and 6.30 pm, and must be vacated between 8 am and 10 am on the day of departure. Please be punctual regarding arrival and departure times. Anyone interested in shorter or longer periods should feel free to contact us, especially close to your preferred dates, and we will let you know about availability and prices. 4. The damage deposit should be paid in cash upon arrival, and will be returned upon departure in the absence of damage. 5. Animals are not permitted except that small dogs may accompany you with our prior permission. 6. Use of the apartment is limited strictly to the persons specified in the reservation. 7. Guests are wholly responsible for the care and safety of their children, of their apartment and of their baggage and personal belongings. We accept no responsibilty for thefts or the losses of your items and baggage. 8. Cleaning costs do not include the cleaning of plates, cutlery and glasses, nor the removal of garbage. The latter must be placed in the metal rubbish skips on the main road outside the gate. A sum of 50 euros will be charged if unwashed dishes or rubbish are left in the apartment when it is vacated. 9. Inside every apartment you will find the Rules which all guests are obliged to follow.